Purpose: This study was aimed at assessing the extent of dispensing prescription-only medications without a prescription in community drug retail outlets (CDROs) of Addis Ababa, Ethiopia. Methods: A descriptive cross-sectional observational study design was used to sample 31 pharmacies, 25 drug stores, and two rural drug vendors from August 11, 2015, to October 21, 2015, through a simple random sampling method. A simulated-patient method of visit was implemented to collect data. Requests of six tracer prescription-only medicines (amoxicillin + clavulanic acid capsule, amitriptyline, captopril, glibenclamide [also known as glyburide], omeprazole capsule, and sildenafil citrate) and upper respiratory tract infection were selected as the simulated clinical scenario. Results: Amoxicillin–clavulanic acid capsule was dispensed when requested in 87.93% of the dispensaries. All of the CDROs dispensed omeprazole upon request. Sildenafil citrate (Viagra) was in stock in 96.55% of the CDROs, all of which issued the requested number of tablets without asking why or for whom the drug was needed. Amitriptyline, captopril, and glibenclamide (glyburide) were dispensed in 84.48%, 89.65%, and 87.93% of CDROs upon the provision of an empty container. Antibiotics were obtained from 75.86% of CDROs for presentation of upper respiratory tract infection symptoms. Among the dispensed antibiotics, the most common was amoxicillin (93.18%), followed by amoxicillin–clavulanic acid capsule (72.72%), and azithromycin (50%). Only 4.5% of the dispensaries asked about drug allergies, and 15.9% of the CDROs informed the simulated patient about the possible side effects of the drugs. Conclusion: This study revealed a very high rate of dispensing of prescription-only medicines without a prescription. Antimicrobials and drugs for chronic diseases were obtained with ease from almost all of the randomly sampled CDROs. Putting good dispensing practice into effect and adhering to the existing national laws and regulations regarding the same are necessary. It is also necessary to adopt a strong and explicit line of action, especially toward the irrational use of antibiotics. The dispensing service may take place in public health institutions or community drug retail outlets (CDROs). CDROs are the main source of medicines in developing countries because of ease of access, wider availability of medicines, less waiting time, and longer hours of working of CDROs.5 Dispensers in such settings are involved not only in filling prescription but also in self-care. Coupled with the increased restructuring of prescription-only medicines (POMs) to over-the-counter (OTC) medicines, dispensers are highly engaged in consultations in response to specific drug requests or symptoms that clients describe. The duty of the provider when responding to symptoms is to make clear the distinction between a minor illness and a more serious condition in order to recommend the appropriate action – which includes advice on nonpharmacologic treatment– and the use of a suitable OTC medicine or advice to visit a health care practitioner.6,7 However, dispensers often fail to adequately assess patients before deciding the type of measures or they recommend inappropriate treatment.8–10 POMs, including antimicrobials, are frequently purchased without prescription from various CDROs in many countries worldwide.11,12 Some of the dispensing malpractices seen in developing countries are attributed to the low level of adherence to the existing laws and regulations on good dispensing practice, lack of knowledge and professionalism among pharmacists, demand from consumers, and business orientation of pharmacies.13 Dispensing POMs without prescription can have a serious effect on the patients’ overall health outcome, including a higher risk of resistance and occurrence of adverse drug reactions.14 In Ethiopia, some studies have documented dispensing of partial doses and POMs without prescription.15,16 Yet, much is not known about the overall practice of pharmacy professionals when confronted with specific drug (prescription-only) requests or on being consulted for treatment based on symptomatic complaints. This study was aimed at assessing the extent of dispensing malpractice by using selected tracer POMs for different indications and an upper respiratory tract infection (URTI) case scenario. The CDROs in Ethiopia are divided into pharmacies, drug stores, and rural drug vendors based on the type of medications they are supposed to dispense and the qualification of dispensers. Pharmacies are run only by pharmacists (with qualification of a university degree or above), drug shops by druggists (with qualification of diploma in pharmacy), and rural drug vendors are run by health assistants. 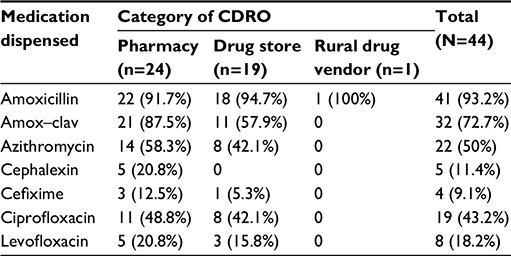 A sample of ∼50 CDROs was analyzed for a 50% rate of dispensing POMs, a 95% confidence level, and a 5% error margin considering the results of previous studies.16,20 CDROs in the municipal areas of Addis Ababa were stratified into pharmacies, drug stores, and rural drug vendors and were assigned a random number through MS Excel random number generator, and 10% of the total CDROs were chosen using a simple random sampling method. A total of 58 CDROs (31 pharmacies, 25 drug stores, and two rural drug vendors) were included in the study. A simulated-patient (SP) method of visit was implemented to collect data. Two different scenarios were developed. The first was a direct query of a specific medication through either presenting with an empty container or direct oral request by name. Six POMs that are used for different indications and considered to be commonly dispensed were selected. These include antibiotics (amoxicillin + clavulanic acid capsule), antidepressants (amitriptyline), antihypertensive agents (captopril), antidiabetic medications (glibenclamide, also known as glyburide), omeprazole capsule, and sildenafil citrate (Viagra). The second scenario was requesting a medicine after presenting with a symptom of URTI. A validated algorithm was used for the conversation between the SP and the dispenser.21 The researcher simulating the URTI presented with complaints of fever, cough, and nasal discharge of 3 days’ duration. Then, the SP noted whether the dispenser asked additional information about the condition. Details of all medicines dispensed, queries about possible drug allergies, and nonpharmacological advice given (including recommendations to see a medical practitioner) were all recorded. Two of the researchers were trained to simulate the scenarios. They underwent a half-day training session that covered many aspects of performing the SP scenarios, including communication and acting skills. The SPs were told not to give or ask further information unless asked, so as to make sure that the information provided by the SPs is consistent. All the selected CDROs received two visits from the SPs in a 4-week interval (one for direct medication query and one for the simulated clinical scenario), and all CDROs received each scenario only once. The study was conducted from August 11, 2015, to October 21, 2015 (includes the summer and autumn seasons of Ethiopia). The SPs either requested the direct purchase of POMs or asked for medication for the selected clinical scenario. The first SP was responsible for inquiring about three tracer POMs (amoxicillin + clavulanic acid capsule, glibenclamide, and sildenafil citrate), while requests for the remaining POMs (amitriptyline, captopril, and omeprazole capsule) were presented by the second SP. Both SPs shared the responsibility of asking for a medicine for the selected clinical scenario (URTI). Immediately after each visit, the SPs filled the data gathered in a fresh form containing a checklist of items that were intended to assess the dispensing-and-counseling process. A pilot study was carried out among the five CDROs that were not included in the final study, to detect possible limitations of both the methodology and the data collection tool (algorithm). All the five CDROs were informed about the objective of the pretest, the methodology, and the time in which the sudden visits occur. All the scenarios and SPs were tested. After collecting feedback from the participating CDROs, slight modifications were instituted in the algorithm for the dialogue between the SP and the dispenser. Data are depicted as percentage of the dispensers’ responses toward the direct medication query and simulated clinical scenario. This study was approved by the ethical committee of the School of Pharmacy, Addis Ababa University. The data collected were kept anonymous. Out of the selected 59 CDROs, one was closed, and thus, a total of 58 CDROs were included. Overall, 361 POMs were obtained from the randomly sampled CDROs. Out of this, 205 (56.78%) were dispensed by pharmacists, 151 (41.82%) by druggists, and the remaining five (1.4%) were dispensed by health assistants. Amoxicillin–clavulanic acid capsule was requested orally without prescription in all the 58 CDROs. Out of 54 dispensaries where the drug was available, the drug was dispensed when requested in 51 (87.93%) of the dispensaries. Dispensers in 23 (45.09%) of the CDROs asked for whom the drug was needed, and dispensers in 27 (52.94%) of the CDROs asked why the drug was needed. All of the CDROs dispensed omeprazole upon request. The only thing that concerned most of the dispensers when requested for omeprazole was the number of strips that clients wanted. Only 22 (37.93%) and 27 (52.94%) of CDROs ask for whom and why the drug was needed, respectively. Sildenafil citrate (Viagra) was in stock in 56 (96.55%) of the CDROs, all of which issued the requested number of tablets without asking why or for whom the drug was needed. Amitriptyline, captopril, and glibenclamide were dispensed in 49 (84.48%), 52 (89.65%), and 51 (87.93%) of CDROs, respectively, upon the provision of an empty package. All of the drugs were not available with rural drug vendors. Pharmacies and drug shops seldom asked about whom the drug was for and why the drugs were needed (Table 1). Abbreviations: Amox–clav, amoxicillin + clavulanic acid capsule; CDROs, community drug retail outlets. Before dispensing, pharmacy professionals in 19 (43.18%) CDROs asked clients further information, including details of symptoms and past medical history. Antibiotics were obtained from 75.86% of CDROs for presentation of URTI symptoms. Among the dispensed antibiotics, the most common was amoxicillin (93.18%), followed by amoxicillin–clavulanic acid capsule (72.72%) and azithromycin (50%). Only 4.5% of the dispensaries asked about drug allergies, and 15.9% of the CDROs informed the SP about the possible side effects of the drugs. Out of the 44 CDROs, 13 (22.41%) asked the patient to visit a doctor, while eight (18.18%) recommended nonpharmacological management (Tables 2 and 3). Abbreviations: Amox–clav, amoxicillin + clavulanic acid capsule; CDROs, community drug retail outlets; URTIs, upper respiratory tract infections. This study used an SP method to assess the extent of dispensing of POMs without a prescription. The SP method can be considered a robust methodological tool for pharmacy practice research, especially in cases wherein knowledge of being observed leads to behavioral change.22,23 The result of this study revealed that more than two-thirds of dispensaries handed out medications without a valid prescription. Similarly, Hussain and Ibrahim9 found that medication was dispensed in 77.1% of the visits, and Abdulhak et al12 documented that antibiotics were dispensed 77.6% of times for visits involving different clinical scenarios; both studies indicated that only a few pharmacies chose referral of patients for medical evaluation. Requests for amoxicillin + clavulanic acid were dispensed at 87.93% of CDROs without a request for a medical prescription. Similar findings were reported in Saudi Arabia, where 100%, 97.9%, and 89.5% of requests for captopril, amoxicillin + clavulanic acid, and fluoxetine, respectively, were dispensed without prescription.24 However, our result is much higher than reported by Abula et al.16 This could be related to the increased competition and business orientation of dispensers in recent times because of the increase in number of CDROs. This study revealed a very high rate of dispensing of POMs without a prescription. Antimicrobials and drugs for chronic diseases were obtained with ease from almost all of the randomly sampled CDROs. We also observed that some medications that are supposed to be handled by pharmacies were stocked in drug shops and by rural drug vendors. Hence, putting good dispensing practice into effect and adhering to existing national laws and regulations regarding the same are necessary. It is also essential to adopt a strong and explicit line of action, especially toward the irrational use of antibiotics. Further studies on inappropriate dispensing of medicines are recommended to determine the magnitude of the problem and to identify the triggering factors at a national level. The authors acknowledge the support of the School of Pharmacy, College of Medicine and Health Sciences, Addis Ababa University, in facilitating the data collection process. Gilbert L. To diagnose, prescribe and dispense: whose right is it? The ongoing struggle between pharmacy and medicine in South Africa. Curr Sociol. 2001;49(3):97–118. Drug Administration and Control Authority. Good Dispensing Practice Manual. Addis Ababa: Drug Administration and Control Authority; 2005. Wiedenmayer K, Summers RS, Mackie CA, Gous AGS, Everard M [webpage on the Internet]. Developing Pharmacy Practice: A Focus on Patient Care Handbook – 2006 Edition. Geneva: World Health Organization; 2006. Available from http://www.who.int/medicines/publications/WHO_PSM_PAR_2006.5.pdf. Accessed May 27, 2016. Junzoh W. Effect of separation of medical dispensary services. JCER Res Rep. 2004;36:1–3. Taylor K, Harding G. Pharmacy Practice. 2nd ed. London: Taylor and Francis Inc; 2005. Winfield AJ, Richards RME. Pharmaceutical Practice. 2nd ed. London: Churchill Livengstone; 2000. Waterfield J. Community Pharmacy Handbook. London: Pharmaceutical Press; 2008. Hussain A, Ibrahim MIM. Management of diarrhea cases by community pharmacists in 3 cities of Pakistan. East Mediterr Health J. 2012;8:635–640. Wafula F. Availability and dispensing practices for antimalarials and antimicrobials in western Kenyan pharmacies. Pharm Reg Affairs. 2013;2(1):1–8. Abdulhak AAB, Altannir MA, Almansor MA, et al. Non-prescribed sale of antibiotics in Riyadh, Saudi Arabia: a cross-sectional study. BMC Public Health. 2011;11:538. Dameh M, Norris P, Green J. New Zealand pharmacists’ experiences, practices and views regarding antibiotic use without prescription. J Prim Health Care. 2012;4(2):131–140. Morgan DJ, Okeke IN, Laxminarayan R, Perencevich EN, Weisenberg S. Non-prescription antimicrobial use worldwide: a systematic review. Lancet Infect Dis. 2011;11:692–701. Abula T, Ashagrie G. Assessment of drug utilization from prescribers and dispensers perspectives in selected town of Amhara Region, Ethiopia. Ethiop J Health Dev. 2003;3:231–237. Abula T, Worku A, Thomas K. Assessment of the dispensing practices of drug retail outlets in selected towns, North-west Ethiopia. Ethiop Med J. 2006;44(2):145–150. Central Statistical Agency (Ethiopia) [webpage on the Internet]. Population Projection of Ethiopia for All Regions at Wereda Level from 2014 – 2017. Addis Ababa: Federal Democratic Republic of Ethiopia Central Statistical Agency; 2013. Available from: http://www.csa.gov.et/images/general/news/pop_pro_wer_2014-2017_final. Accessed May 27, 2016. Food, Medicine & Health Care Administration & Control Authority of Ethiopia (FMHACA). FMHACA List of Pharmaceutical Industries, Retail Outlets, Importers and Wholesalers in Ethiopia (Personal Communication, 18 Aug 2015). Addis Ababa: Food, Medicine and Health Care Administration and Control Authority; 2015. Dua V, Kunin CM, White LV. The use of antimicrobial drugs in Nagpur, India. A window on medical care in a developing country. Soc Sci Med. 1994;38(5):717–724. Anita S, Suba S, Birger CF. Pharmacy-based dispensing of antimicrobial agents without prescription in India: appropriateness and cost burden in the private sector. Antimicrob Resist Infect Control. 2015;4:55. Watson MC, Skelton JR, Bond CM, et al. Simulated patients in the community pharmacy setting: using simulated patients to measure practice in the community pharmacy setting. Pharm World Sci. 2004;26(1):32–37. Watson MC, Norris P, Granas AG. A systematic review of the use of simulated patients and pharmacy practice research. Int J Pharm Pract. 2006;14:83–93. Al-Mohamadi A, Badr A, Mahfouz LB, Samargandi D, Al-Ahdal A. Dispensing medications without prescription at Saudi community pharmacy: extent and perception. Saudi Pharm J. 2013;21(1):13–18. Hammad J, Qusa H, Elessi K, Aljeesh Y. The dispensing practice of the over the counter drugs in the Gaza strip. IUG J Nat Eng Stud. 2012;20:31–39. Steil C. Managing diabetes: special patient groups: role of the C.D.E. US Pharm. 1989;14(suppl):5–6,8,10. EFMHACA. List of Medicines for Drug Shop. 4th ed. Addis Ababa: EFMHACA; 2012. Koda-Kimble MA, Young LY, Alldredge BK, et al. Applied Therapeutics: The Clinical Use of Drugs. 9th ed. Philadelphia: Lippincott Williams and Wilkins; 2009. Chalker J, Ratanawijitrasin S, Chuc NT, Petzold M, Tomson G. Effectiveness of a multi-component intervention on dispensing practices at private pharmacies in Vietnam and Thailand–a randomized controlled trial. Soc Sci Med. 2005;60(1):131–141. Kagashe GAB, Minzi O, Matowe L. An assessment of dispensing practices in private pharmacies in Dar-es-Salaam, Tanzania. Int J Pharm Pract. 2011;19(1):30–35. Contopoulos-Ioannidis DG, Koliofoti ID, Koutroumpa IC, Giannakakis IA, Ioannidis JP. Pathways for inappropriate dispensing of antibiotics for rhinosinusitis: a randomized trial. Clin Infect Dis. 2001;33(1):76–82. Volpato DE, de Souza BV, Dalla Rosa LG, Melo LH, Daudt CA, Deboni L. Use of antibiotics without medical prescription. Braz J Infect Dis. 2005;9(4):288–291. Llor C, Cots JM. The sale of antibiotics without prescription in pharmacies in Catalonia, Spain. Clin Infect Dis. 2009;48(10):1345–1349. Bartoloni A, Cutts F, Leoni S, et al. Patterns of antimicrobial use and antimicrobial resistance among healthy children in Bolivia. Trop Med Int Health. 1998;3(2):116–123. Larsson M, Kronvall G, Chuc NT, et al. Antibiotic medication and bacterial resistance to antibiotics: a survey of children in a Vietnamese community. Trop Med Int Health. 2000;5(10):711–721. García-Cobos S, Campos J, Cercenado E, et al. Antibiotic resistance in Haemophilus influenzae decreased, except for beta-lactamase-negative amoxicillin-resistant isolates, in parallel with community antibiotic consumption in Spain from 1997 to 2007. Antimicrob Agents Chemother. 2008;52(8):2760–2766. Kotwani A, Wattal C, Joshi PC, Holloway K. Irrational use of antibiotics and role of the pharmacist: an insight from a qualitative study in New Delhi, India. J Clin Pharm Ther. 2012;37(3):308–312. McManus P, Hammond L, Whicker SD, et al. Antibiotic use in the Australian community, 1990-1995. Med J Aust. 1997;167(3):124–127.